In some places, the holiday breaks are in full swing, while others’ holidays or vacations are just around the corner. Well, we have great news! Universe2go is a perfect fit for taking it on a trip, in order to see the stars and universe from other places around the world, to give you a brand new perspective on the cosmos! With the help of your smartphone and our app, Universe2go allows you to see the night sky, complemented by a virtual image of the night sky, including numerous factoids and explanations of constellations, galaxies, star clusters and nebulae. The Alps count as one of the darker regions in Europe. Away from cities and towns, high up in the mountains, stargazers have a wonderful view of the variety of celestial objects. If you were to, for example, drive or hike along the Großglockner high alpine highway, you could enjoy a beautiful alpine panorama during the day. Once night falls, you can then use Universe2go to discover the constellations and their stars in all their glory. Scotland’s highlands also offer ideal conditions for stargazers, given that artificial light is rare. In Great Britain’s largest national park, you can not only expect majestic mountains and mysterious Lochs, but also a fantastic sight into the night sky. 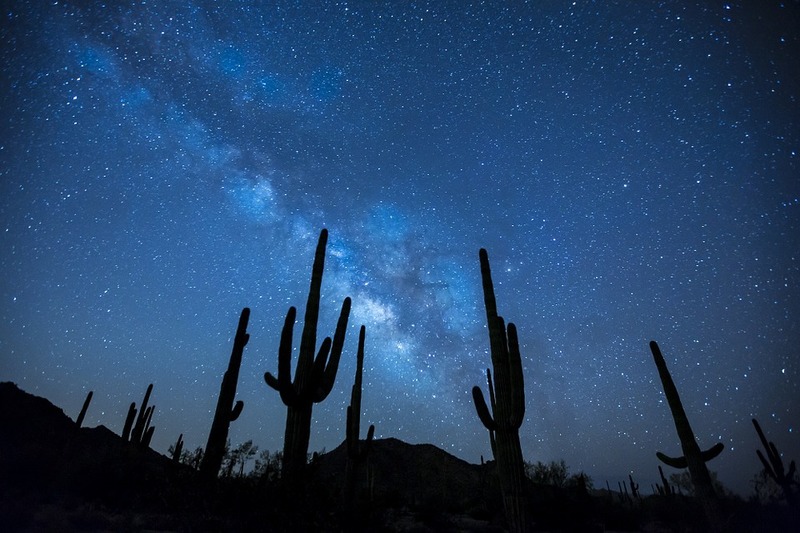 National parks are generally perfect locations for stargazing, as long as you don’t come across any wildlife. Yellowstone, Yosemite and Grand Canyon National Parks in the USA all offer an exceptional view of the night sky with often perfect conditions. Big sky country along the Rocky Mountains can be similarly enthralling, with northern New Mexico, Estes Park, Colorado, and Wyoming and Montana coming immediately to mind. These areas with their relatively low population densities and artificial light make stargazing as easy as pie. If you happen to have a significant adventure around the corner with a trip to Africa or Asia, see if you can take a trip outside of the cities to one of the many national parks. Bringing a Universe2go on one of these trips, even to the middle of the Sahara, will be worthwhile, as the app doesn’t require internet connection or mobile service to work! With that in mind, do you plan on going on a cruise? The cruise industry is growing around the world, as evidenced by ‘Harmony of the Seas’ – the world’s largest cruise ship – and if you happen to book a trip on one, don’t forget your Universe2go! If you are drawn towards warmer locations during the summer months, a trip to the Caribbean or southern Europe may be on the cards. A tour of Mount Etna in Sicily provides a good opportunity to stargaze. Hobby astronomers and tourists are often amazed at the amazing view of the stars and for those of us in large cities, the often invisible yet breathtaking Milky Way! Tenerife of the Canary Islands right of the coast of Morocco is home to the volcano Teide. Teide is not only Spains highest mountain at 3,718 m (12,200 feet), it also also offers ideal conditions for stargazers after an afternoon hike! A trip to Hawaii’s Mauna Kea, Chile’s Atacama desert or to Japan’s Mount Fuji offer similarly spectacular views! If you happen to be in Portugal, a trip to the sparsely populated south of Algarve – one of Europe’s best locations – would be well worth the effort! In summation, places with little population and thus little artificial light, are prime real estate for stargazing. Such dark areas also give you the chance to get away from your screens (including this one) and get some well-needed R&R. Enjoy your summer! If you happen to capture any fantastic images of the night sky or your travels, feel free to share them on our Facebook, Twitter or Google+ pages!